If I were using this in class, I'd probably animate it so students had to choose values for velocity, start height and distance and hit "GO." Nevan: Dad when do you have to go back to work? Me: I'm off for three weeks. Nevan: Ok. Well, today's the 20th. Plus 7, that's the 27th. 4 more to the 31st. The other 3 for January 3rd. Plus 7 more...the 10th. You go back to work on the 10th. Why is that the formula? She went on to describe how it's like taking a bunch of CDs and stacking them. We know we can find the area of a CD. We use the height to determine how many circles it takes to make up the cylinder. But it's just like a line [it has no height]. How do you get volume with that? If you have a thing of CDs and stack them...you're going from 2D to 3D. But area has no height. We're stacking things that have no height. So we talked a little about finding the volume of a rectangular prism is just counting the number of cubic units it takes to fill the prism and how doing that with a cylinder is tough because its round. I liked the direction they were going with this by trying to talk about something larger by defining it by its smaller parts. So small, in fact, that the height is practically 0. I ask, So how can you find the volume of a sheet of paper? Dude, why don't we just make a stack that's 1" tall and divide by the number of sheets it took to make it? 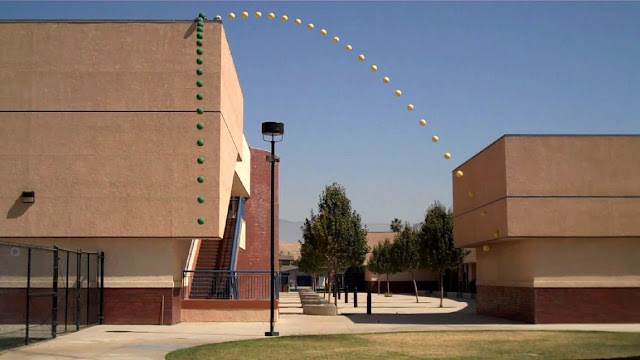 They all agreed that would work and I thought we were ready to move on when a boy asks, "So what's the volume for a sphere?" They wrestle with this for a minute or two when one of them turns to me and says, "Mr. Cox, you know, huh?" But you're not going to tell us are you? I don't care what the formula is. I want to know why that's the formula. Next semester's gonna be fun. "Hey, Mr. Cox. 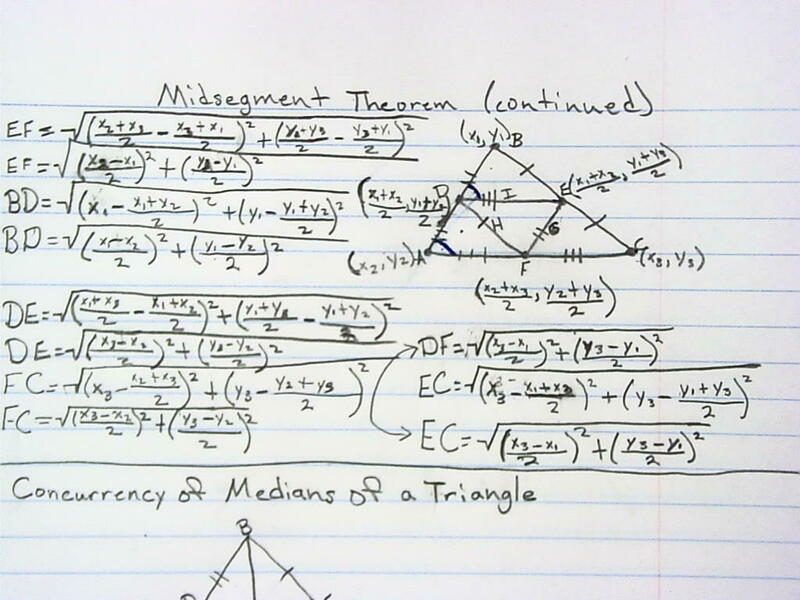 Is there a theorem that says this?" I'm not sure. Why do you think that's true? 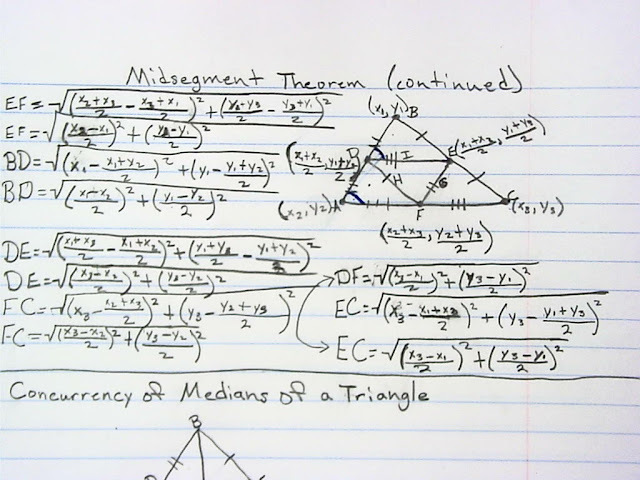 "Well if a triangle has 180o and I know two of them, then the third one has to be whatever's left over from 180o. 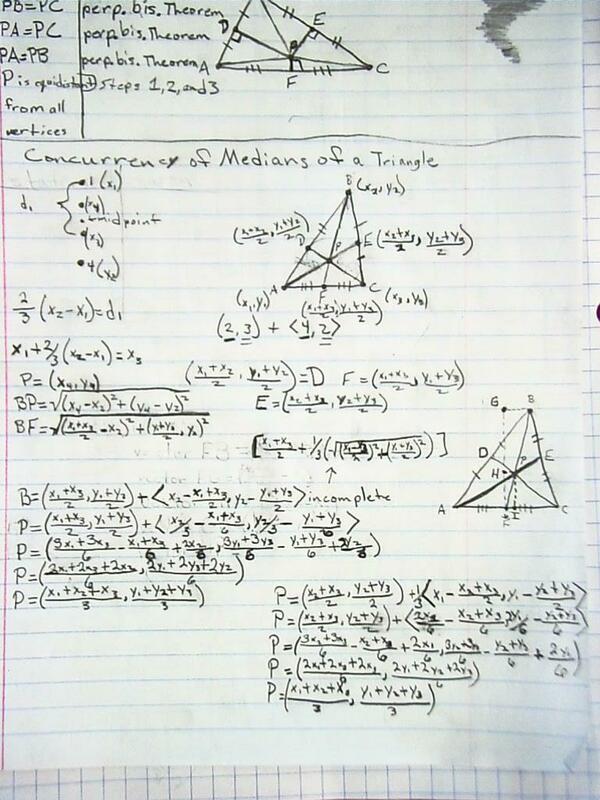 But that third angle and x make a straight line so they have to add up to 180o too." If it's true, what would you call it? 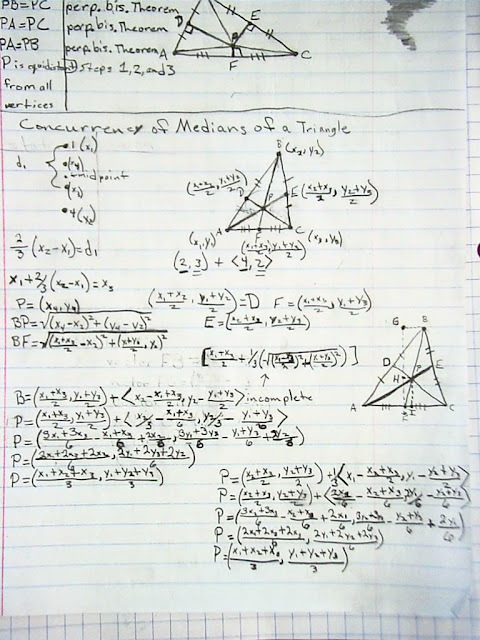 "I remember seeing something about 'exterior angle' in the index one time, so that's taken. Maybe I'll look it up and see what that one means." "Ah, man! Someone already discovered it." I kept reading about all the fun everyone was having with the ProjectEuler thing, so I thought I'd give it a try. 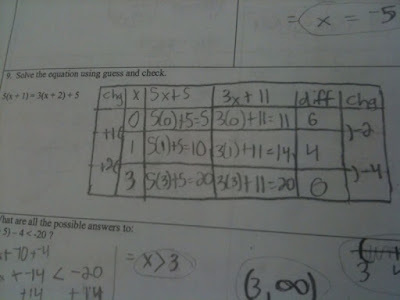 I thought it was pretty easy until I got to that one problem where they ask you to add up all the multiples of 3 or 5 that are less than 1000. I hear that people are using Python and letting the computer do the number crunching. So, I think to myself, "Self, you took Pascal about 20 years ago back when RAM was measured in single digits and you said 'bless you' if someone said, 'gigahertz.' in college and absolutely hated that freaking class came out a better person because of it. This may be something you don't have time for, I mean you have 5 kids. Wake the heck up an enriching experience. And besides...Pascal...Python, they both start with Ps yeah, that's probably the only thing they have in common. You got this, man. G'head, give it a try." 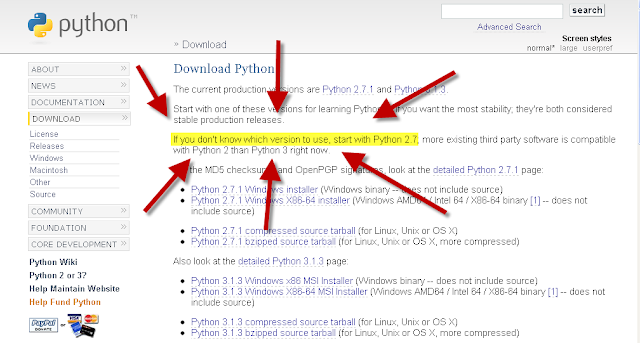 I go to the Python site and read every thing I can to figure out which version would best suit me. (There's a lot to choose from, you know.) I can't find anything anywhere. It's all so confusing. Please. Someone. Give me a nudge in the right direction. So I take a shot in the dark and go with v.2.7. 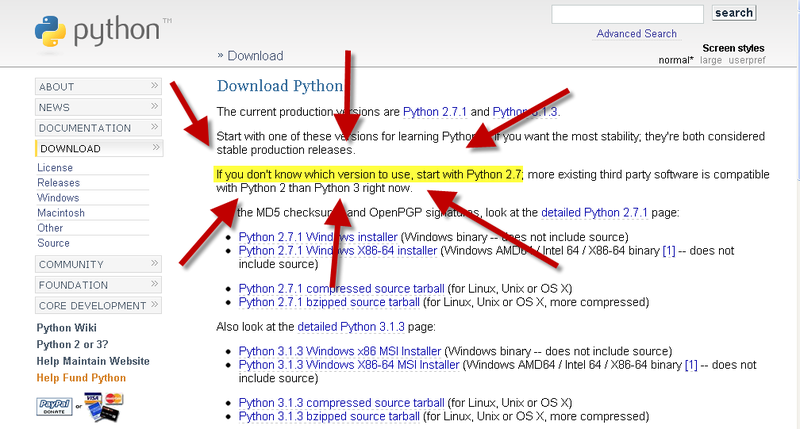 Anyway, this isn't really about Python. It's about the video I grabbed while downloading the program. I'm going to have my kids wrestle with it after break. Download Time (Question) from David Cox on Vimeo. 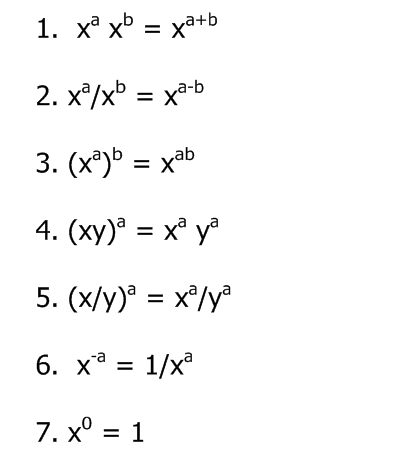 I may not ever find the solution to that really difficult problem about multiples of 3 and 5, but at least I got a lesson out of it. I've usually encouraged this process as it seemed to be the efficient way to cover the majority of these skills. But this year, I kept it much more loose. 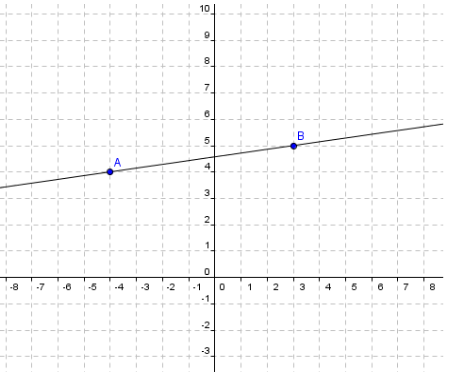 We all agreed that if the two points given define a line with an integer for the y-intercept, then it's pretty easy to write in slope intercept form. I mean, c'mon, we've got the slope and we see the y-intercept plain as day. We know the slope is 1/7 and we can estimate the y-intercept, but how can we know the y-intercept? 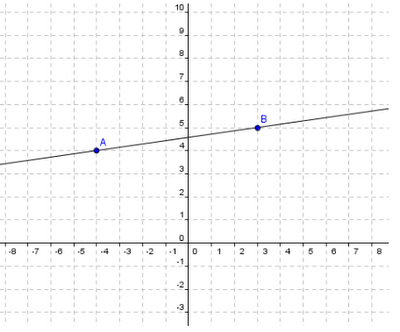 Most of the time when we discuss Slope we talk about the path from one lattice point to another. 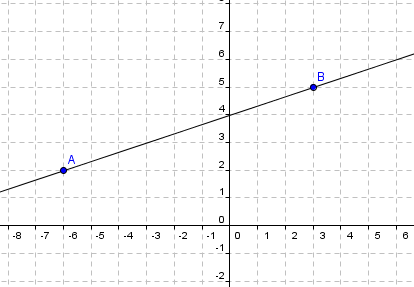 For example, the slope between A and B is 1/7 because we go up 1 and over 7 to get from A to B. But we have been doing more with rate of change as a unit rate which means that for every 1 unit of horizontal change, we increase 1/7. Yeah, I know that sounds elementary, but it makes a difference in how your kids see these things. 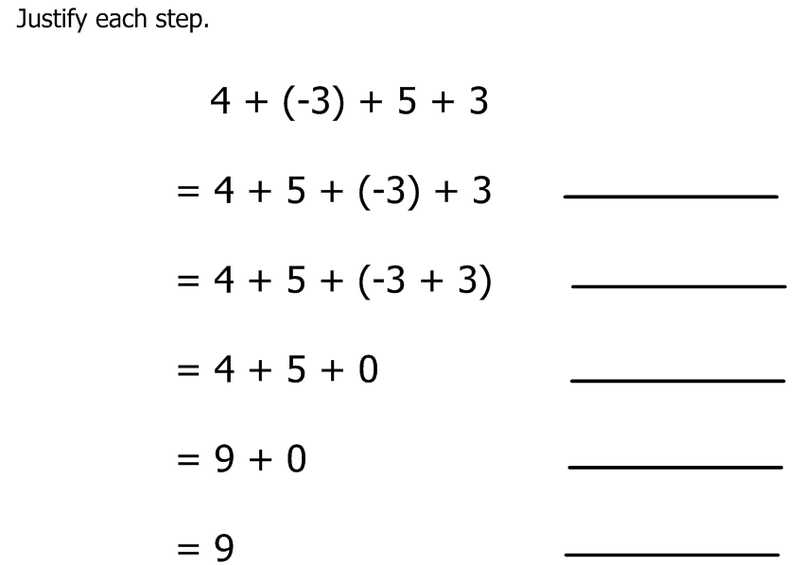 If each step increases 1/7, we increase a total of 4/7 to get to the y axis. Therefore, y-intercept is 4 4/7. We still talk about point-slope form, but this beats the heck out of the plug and chug that usually goes along with it. I'm still a believer in the taxonomy I wrote about a while back. I can teach duplication like no body's business and finding ways to get students to apply what we are learning isn't a problem. It's the creation part that I get hung up on. 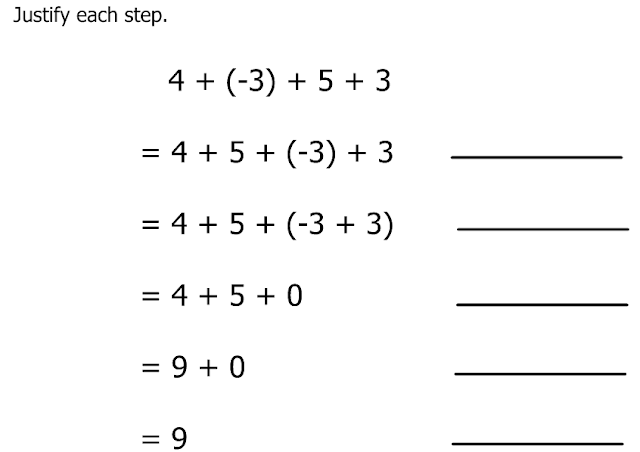 I want my students to find ways to make their own connections with the math. Assignment: Pick something that interests you; something that you can connect to one of the concepts we've covered this semester. 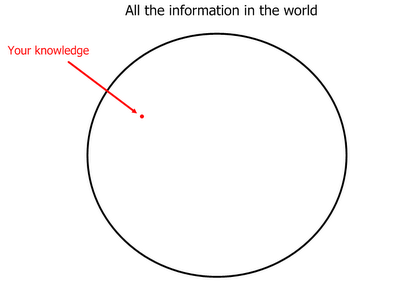 Learn as much as you can about it. Tell us what you've learned. I only had one requirement: Don't ask yourself, "What is Mr. Cox looking for?" Keep in mind that I get the kids who taught Clever Hans how to read people. They are fantastic kids, but they also have learned how to game the system. Find a way to jump through the fewest hoops (or at least the most efficient way to jump through them all) while gathering as many points as possible on the way to be-all-end-all of educational existence: The A. This assignment scared the crap out of some of them. This was the most unhelpful I've ever been. I allowed them to work on their own or in groups (up to 3). We discussed the benefits and pitfalls to working alone vs. working with a group. As we approached the due date, we started to discuss how this assignment should be graded. Again, I took a back seat on this. We just recently opened up the sequoiahawks.org domain for our students to gain access to Google Apps, so this was a great opportunity to have them work collaboratively on a rubric. My 8th graders had some experience with this as we used G-Docs last year, but this was new to all of my 7th graders. The only input I had in this process was to create the document and ask a few questions. The rest was all them. I found that some of the conversations that took place regarding what to include, what to exclude and what categories were the same (ie. "Aren't self interest and effort the same thing?") were very refreshing. These kids were really thinking about what was important. It was nice to see students take things that we have done in class and either find a context for them or extend them beyond what we've done in class. There were a couple of presentations that stood out for their creativity and some for their thought provoking qualities. We had a few nice class conversations that came from questions posed in the presentations. Both classes had someone ask the question: is .999...=1? which provided a great opportunity for discussion. 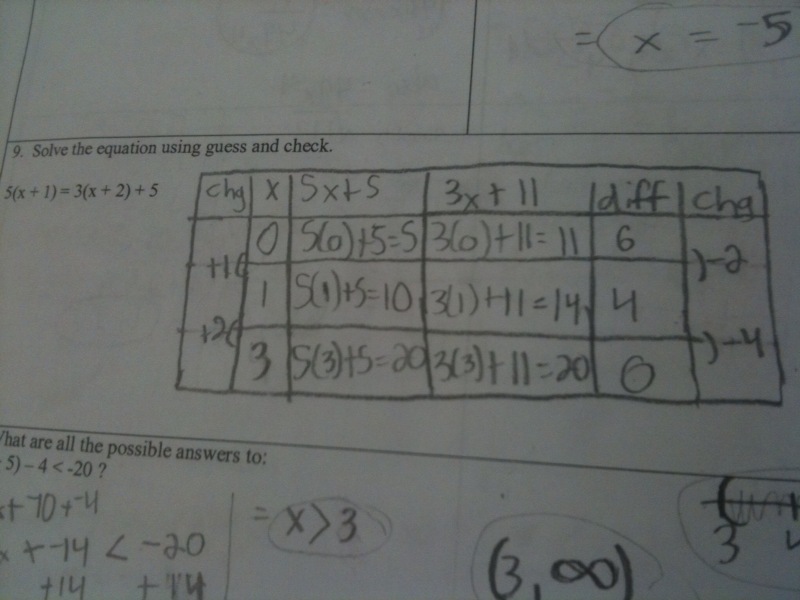 The 8th graders were pretty curious and this led to a conversation on ∑ notation, ∞ and limits. We did have a few groups that mailed in the projects, though. I had a tough time not airing them out publicly (in one case I did) as they showed complete disrespect for their classmates' time. This demonstrates that the hoop jumping is not quite out of their system, although I'd say we are off to a decent start. We used the information to come up with an average price and dropped it into Excel and came up with a best fit line and all. Personally, I find Excel clunky, but since we could use it to quickly calculate average price, we went with it. 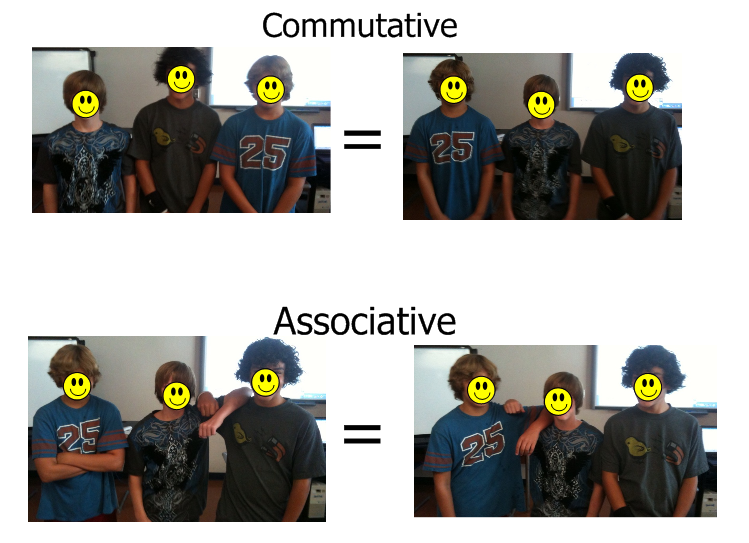 But it just so happens that I'm doing linear relationships with my 7th graders, so I get a two-fer with this one. 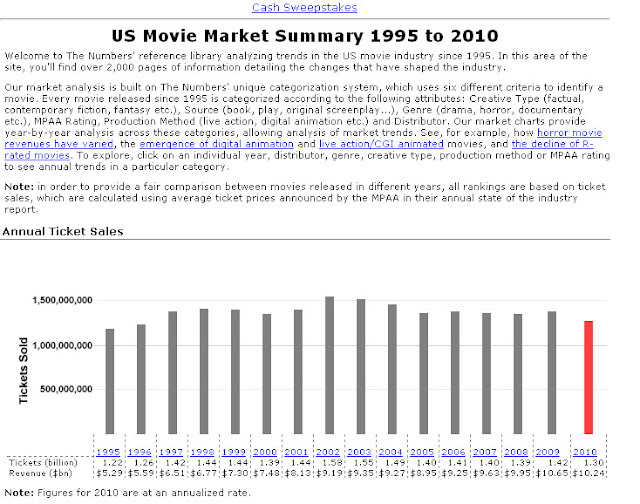 Step 1: Calculate average ticket prices and created a scatter plot. This went pretty quickly, but one group mistook the raw number for the average ticket price. 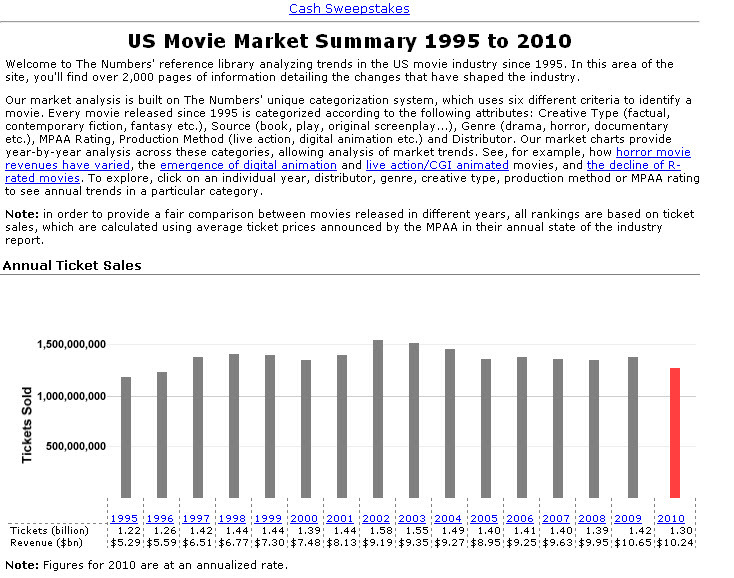 For example: from 2003 to 2004 the revenue went down, but so did the number of tickets sold. The raw numbers led this group to believe that the prices went down. After a quick conversation, they realized that if the number of tickets sold decreases as well, the price can actually increase. Step 2: Predict the price of a ticket in 2020 and justify answer. Most groups used the trend of the graph to predict, but one group actually calculated the average rate of change from year to year and came up with $.24/year. They used this to extrapolate a price in 2020. Step 3: Decide what type of curve best fits the data. Two camps on this one: Those who thought it was linear and those who thought it would be like "the graph we got when we did compound interest." Nice work kids. Note: We will explore that exponential thingy but we ran out of time today. Step 4: What line would best fit the data? They were creating a group graph so they took a meter stick and just plopped it down where they thought the line should go. Step 5: Estimate the equation of that line. We played with this applet yesterday, so students had a pretty good idea how to use the graph to predict what the equation should look like. I was pleasantly surprised at the fact that all groups decided the rate of change was somewhere between $.22 and $.25 and all said the initial condition was $4.34. 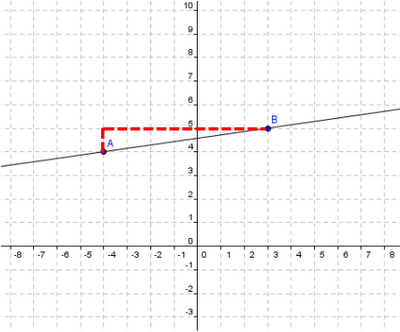 Step 6: Let GeoGebra work her magic. 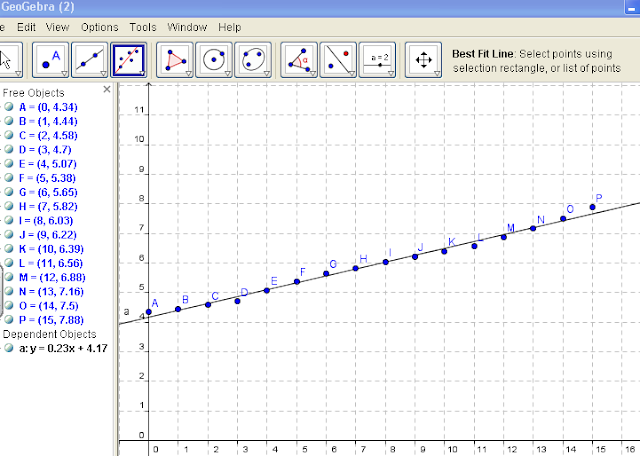 Add the ordered pairs and use the "Best Fit Line" tool to calculate the regression. Step 7: How good was our guess? Dan's getting more mileage out of this problem than I am. Either way, there are some good questions being asked re: pseudocontext, relevancy and so on. So I'm curious, which one would you use and why? Toaster Question from David Cox on Vimeo. Toaster Question (1-4) from David Cox on Vimeo. Toaster Question 2 (1-4) from David Cox on Vimeo. Toaster Answer from David Cox on Vimeo. Funny what you come up with when making breakfast for your kids. Between 2nd and 3rd periods I usually step outside class and wander the plaza as kids are heading to their next classes. Today I happened upon a group of students who were waiting for their teacher—many of whom are in my 4th/5th block. So I take a seat next one of my students as he's waiting for the door to be unlocked and we discuss how his faux-hawk could have been used to cut the stress joints in the concrete slab beneath our feet, you know, because that's just me. So he turns to me and says, "You know, Mr. Cox, you're my only teacher who I could see talking to me outside of class." "I dunno, other teachers just don't talk to me outside of class." Don't they know who you are? They're missing out. We were going over our quizzes yesterday and I had a student make an interesting observation about the rubric we use to determine the overall score on a concept/skill. She says, "This reminds me of the first time my brother and I made waffles without my dad helping us." "We used baking soda instead of baking powder and they turned out really bad." How's that like our quiz? "We can know what we are doing but make a simple error and it messes the whole problem up." So what would you rather do: know how to cook the waffles and use the wrong ingredients or use the right ingredients but not know how to cook? "I'd rather make the mistake with the ingredients." "Because all I have to do is use the right stuff and the waffles would've been good." Is that easier to correct than if you had all the right stuff but you didn't know how to cook? "...and Anakin Skywalker thwarted the nefarious plot." So I ask Dawson, "What does nefarious mean?" "What do you mean, Dad?" What's nefarious mean? The guy just said that Anakin thwarted a nefarious plot. "Well, it must be really bad because he was talking about the evil scientist." It never ceases to amaze me how these teachable moments just fall in my lap. I just have to be paying enough attention to them and take the time to ask a couple of questions. I wonder how many of them I actually miss, though. Nevan (8) goes to the counter to grab a pack of gum from a box that contains four different flavors. He says, "Hey Dad, look. There's four different kinds of gum in here." Oh, yeah? How many of each kind are there? Then how many packs of gum are in the box? Really? How do you get ten? On our way home Aidan (5) asks, "Dad does it hurt Jesus' hands when we drive?" "Does it hurt Jesus' hands when we drive?" "Our truck drives on tires." "And the pokey things hurt the road." "And Jesus' hands are under the road holding it." Dawson (12) says, "Dad, I think he thinking of 'He's got the whole world...in His hands...'"
Is that what you mean, Aidan? "Yeah. So then, when we drive, it hurts Jesus' hands, right?" I love this! We are always looking for ways to iterate problems and extend them, but there's nothing to extend with this problem. It's all ready for the wolverine wrangler to do his stuff. I'm looking for the guy who can make this wolverine sit and quit bearing its teeth so my 8th graders can pet it for a second. GeoGebra does this. Mr. H's applet makes this problem accessible to an 8 year old. In fact, my son was so mesmerized by the animation that I swear I heard him muttering, "Heffalumps and Woozles. Heffalumps and Woozles." Heck, I found a strange urge to put on some Pink Floyd myself. Now, talk about storytelling. The table's been set for the sequel that the kid's gonna have to wait a couple of years to see. 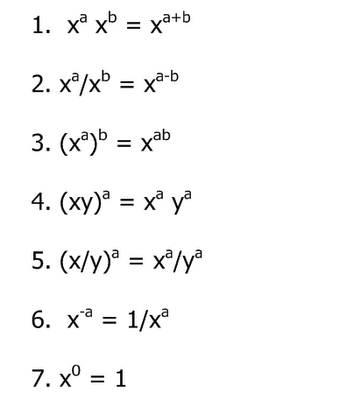 precalculus kids can actually calculate the answer and the trilogy will be complete once they have the tools to actually prove that for n chords, the product is n+1. This problem can span four years. At least. Apologies if I misused the metaphor. I learned how to learn when I was in college. No one told me. It just happened. As a teacher I have tried to help this process along a bit for my students because it kinda pissed me off that I spent 14 years in school and no one actually told me, "Learning is about the questions you ask, not the answers." 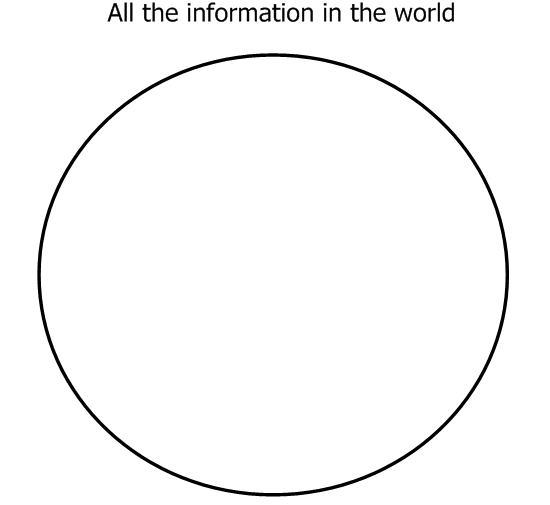 So that pretty sums up my teaching philosophy. It hasn't changed much in 16 years. Kids don't get that. They think that as long as they get the right answer, who cares about the how and the why? Questions and answers are on opposite teams. Answers get my work put on the refrigerator. Questions mean I don't know the answers. Answers mean I know. Questions mean I don't know. 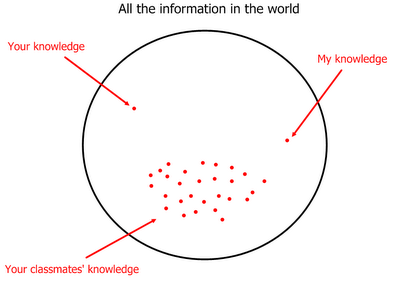 I can't let 'em know I don't know. That's wrong. It's our job to change that. It's not easy and you have to set the table for yourself. The pillars to a questioning classroom involve: Truth, Trust, Togetherness and Transparency. I talk to my students. A lot. In just about every year I've taught, I've had some variation of the same discussion with my classes. For some classes, this talk happens in the first week. For others it doesn't happen until the second semester. But inevitably, it happens. 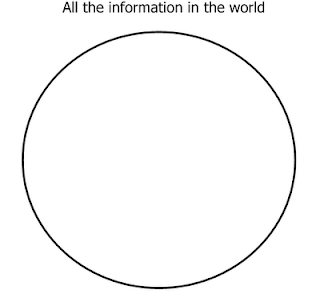 Suppose all the information in the world is contained in this circle. We're kinda in the same boat. Not much to brag about and not much to be embarrassed about. What happens when we share? 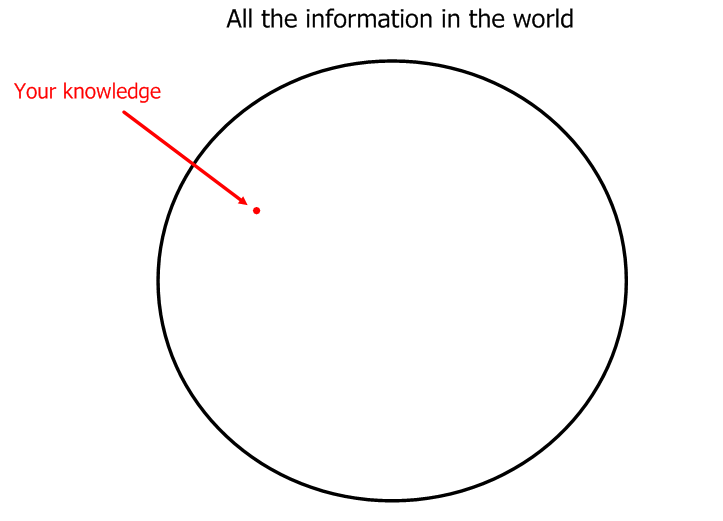 And the more we learn, the sooner we realize that this circle is waaaay too small. If our goal is to learn everything there is to learn, then we are chasing a finish line that's moving away from us much faster than we're moving towards it. 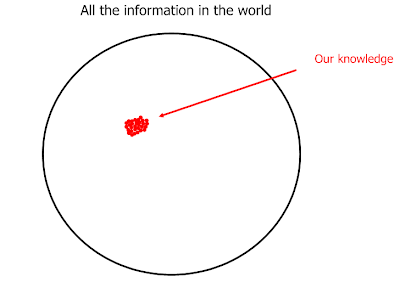 The only way we begin to know is when we realize that we don't know...and become OK with that. 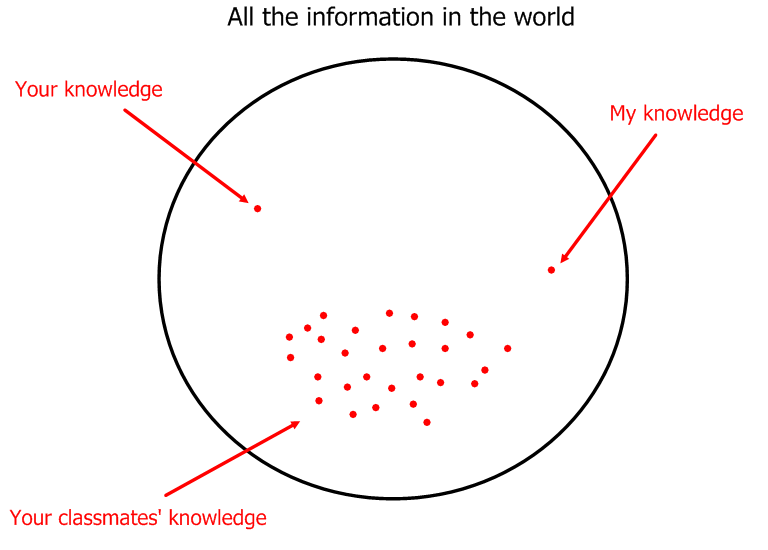 So, how do we share our knowledge? Once we've established that we're all really in the same boat, there's no excuse for false pride. It's time to build trust. Do I really believe what I told them? I make it very clear to my students that I'm not smarter than they are; I just have more experience. 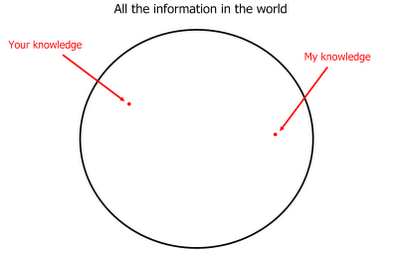 I make it very clear that I don't tolerate anyone looking down on others for asking questions. I'm not so much of a there's no such thing as a dumb question kinda guy as much as I am a who are you to look down on someone who doesn't know? You didn't know the first time you tried kinda guy. This always leads to a digression about the first time we all tried to walk or ride a bike (my kids turn out to be great fodder for these kinds of discussions) which furthers the trust factor as I let them into my life a bit. I don't let my students say, "That's easy" when someone asks a question because it deflates the questioner. Quickly. First time that comes out of someone's mouth I say, "Everything's easy once you get it." I have to be honest, establishing trust was much easier for me when I taught high school. It's been a bit more of a challenge with 7th and 8th graders because I have a Kate-ish thing for truth. Sometimes I have to dial it back a bit without becoming falsely warm and fuzzy. It takes some students quite a while to adapt to my questioning style in class. I've had kids want to drop my class (especially when I was at the high school) because "he doesn't give me the answers" "he never answers my questions." It's tough sometimes because kids are resolute. They'll try to corner you into taking the pencil out of their hand. The key is consistency. The more questions I ask, the more willing they are to ask. One of the things I've done to help establish a willingness to ask questions is give the class lateral thinking puzzles. I mean, c'mon, there's no way you can guess the answer on some of these on the first try. Asking questions and being wrong are part of the process because they help us eliminate potential possibilities. It takes kids time to figure this out because they want to be specific with their questions at first which is very counterproductive. They have to learn to start with very general questions and the yes/no answer tells them whether or not to continue down that path. Once they get the hang of this, they start to realize that there are common themes in many of these puzzles which can be applied to later puzzles. This works nicely with problem solving strategies down the road. At some point I throw out the challenge for them to find a lateral thinking puzzle that will stump me, which can't be done (or so I say). The trash talk ensues and I model the heck out of how one goes from the very general question to more specific questions. The important thing here is that we do these as a class, together. Transparency has two meanings here: The I'm-not-here-to-trick-you-here's-really-what-I expect kind of transparency and the physical-posture-I'll-take-in-class-so-become-invisible kind of transparency. What do we need to do in order for us to learn? I don't have just one (physical) focal point in my room. I have a SmartBoard on one wall, a dry erase board on the adjacent wall, multiple dry erase easels spread out throughout the room and I roam around using a wireless tablet that lets me annotate my slides. 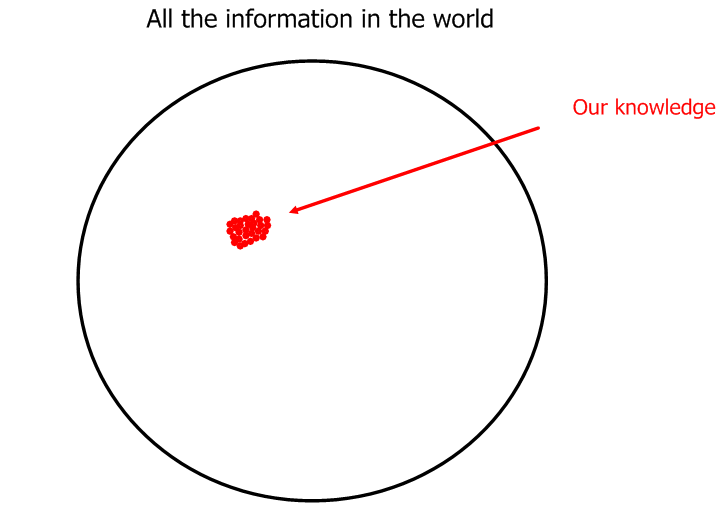 The focal point is the content, not a person. Students need to learn that the teacher is just one of many resources and doesn't necessarily have to be the primary resource. This means that I have to make myself invisible at times. I usually walk to the opposite side of the room as the person who is talking or maybe I actually take a seat during discussion and stare at the floor. 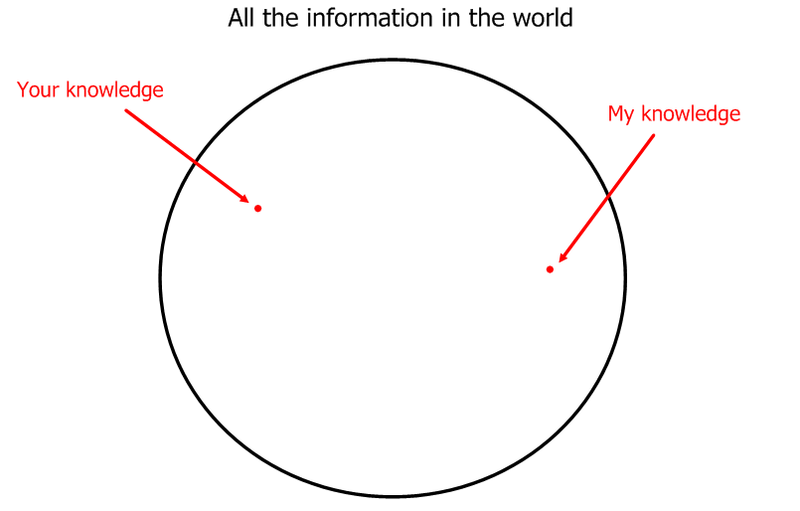 I've found that kids start to depend on each other if I'm not there (so to speak). And when they depend on each other, they tend to start asking questions. So, I guess at the end of the day, I try to be as real with my students as I can. This all comes down to relationships founded on truth; a truth that we can only catch glimpses of. We often times beat ourselves up because we don't see the fruit of our labor. These "soft skills" (who coined that term, anyway?) are really the reason we do what we do. We spend a copious number hours finding ways to offer immediate feedback to our students but our feedback is much more slow cookin'. We won't know if the time we spend with our kids will pay them dividends down the road, especially when it comes to these "soft skills." That comes when we see our students after they have finished college (or maybe they didn't go to college and went straight to work) and started their own families. That's when we see the fruit. So be patient, the harvest is comin'. Huge thanks to Riley for putting this together. The posts that have been assembled have been phenomenal and everyone who took the time to put something together should be commended. My class layout. I teach in a an "art room" but since we don't offer classes like that anymore, I'm in it. Students sit in pods (equipped with outlets making computer time nice), 4 or 5 to a group depending on class size. I'm hardly in the same place for more than 5 minutes.